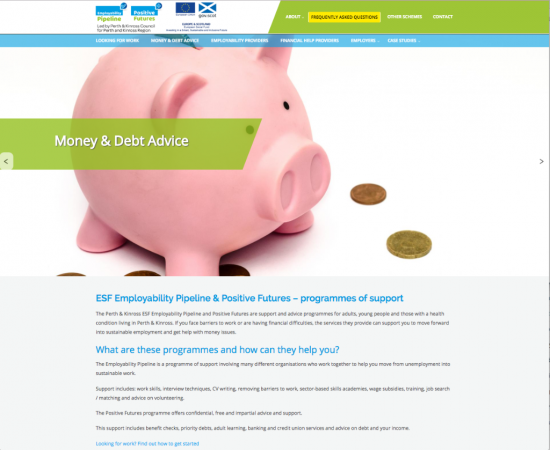 The Perth & Kinross ESF Employability Pipeline and Positive Futures are support and advice programmes for adults, young people and those with a health condition living in Perth & Kinross. If you face barriers to work or are having financial difficulties, the services they provide can support you to move forward into sustainable employment and get help with money issues. What are these programmes and how can they help you? The Employability Pipeline is a programme of support involving many different organisations who work together to help you move from unemployment into sustainable work. Support includes: work skills, interview techniques, CV writing, removing barriers to work, sector-based skills academies, wage subsidies, training, job search / matching and advice on volunteering. The Positive Futures programme offers confidential, free and impartial advice and support. This support includes benefit checks, priority debts, adult learning, banking and credit union services and advice on debt and your income. Do I need to be referred to these programmes? No, you can contact any of our providers directly, if you meet the eligibility criteria. For Employability help that means you’ll be facing two or more barriers to work. For Positive Futures support, you will be eligible if you face one or more of the barriers on that list. You can also be put in touch directly with one of the providers by another organisation such as the Job Centre. These services are part-funded through the European Social Fund (ESF) employability and social inclusion programme, additional funding has also been provided by The Gannochy Trust and both Programmes are managed by Perth & Kinross Council. The provider organisations offer the support and you can contact them directly if you need to access this support. If you’re an employer and you’d like to find out more, you can read what other employers have said about the Employability Pipeline or find out about the current Labour Market. A brand-new website has been launched to help Perth & Kinross residents move into work or get support with money and debt issues.